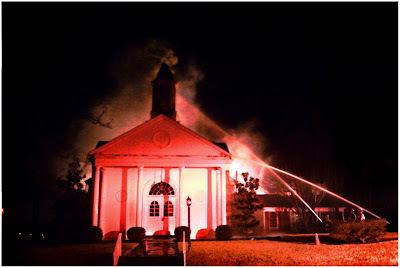 7 church fires in the last 3 weeks. 5 in areas near us - within a few miles - and 2 here in town. The 6th Saturday night, the 7th last night, less than 24 hours later. 4 of the the first 5 have been ruled arsons, and the 5th? Remember this? Only the sign is left, but it was an act of God, so to speak. Hopefully. 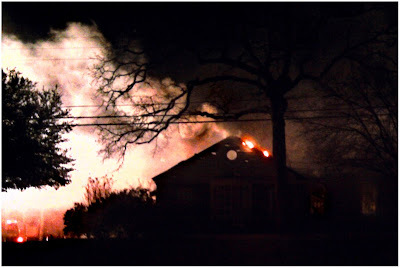 Last night's fire was in my neighborhood. A church that has been here for as long as I can remember. A message on Facebook alerted Katie, she messaged me and then she & her hubby were off to see, thinking it was under control, and it was, but the church was gone, the entrance in the image above almost all that remained, all the roofs gone. I began to smell the smoke and decided to walk up, on my way receiving another message - omg it is horrible, was all it said. Traffic was stopped a couple of blocks from my house and within another block the church came into sight; a few more steps and I began to take pictures. Another few steps and I found Katie and our next door neighbors, and across the street we went to stand in front of those last remaining doors, the fire inside the belfry refusing to be extinguished, the steeple hanging by its side, refusing to fall just yet. 7 churches. 4 arsons proved. All burned to the ground. to all the other churches. We are surrounded by churches. to my right as I sit at my desk. is a question I cannot answer. unable to even find words for the question. and I heard sirens for another hour. how incredibly sad. that really hurts the heart. One wonder what makes people do something like that? I hope they solve this fast. how terrible. I wonder if someone is really angry, or if they just like to set fires... but the fact that it seems to be only churches is odd. I hope they find the person or persons. I just don't understand that... I am so sorry and hope that they catch this person soon. oh gosh that is so sad, why indeed! I hope they can solve this soon. how terrible. you have to wonder why someone does something so destructive like that. oh this makes me so sad. i just can imagine. hope they can get to the bottom of this... and fast! this is so very sad -- i am sorry to hear this. It makes no sense, does it? so many cherished and reverent memories destroyed...marriages, funerals, births, Christmases, Easters...ashes to ashes...they know not what they have done. I will never understand this kind of disrespect...what has got to be going on inside a person who feels justified to commit such an act? We are a young society, aren't we?